Click here to see articles by and about our attorneys. Welcome To Cooling & Herbers! 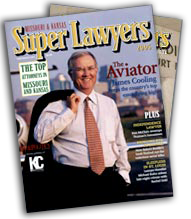 Cooling & Herbers is an industry leader in aviation law. We are also recognized for our extensive experience in business law, civil litigation, environmental law and municipal law. Since 1977, we have been providing outstanding legal service world-wide from offices in the heart of America. Along with our home office in Kansas City, Missouri, Cooling & Herbers operates an office in Wichita, Kansas (the “Air Capital of the World”). Our team of seasoned attorneys is dedicated to providing top quality, effective and cost-efficient legal services. At Cooling & Herbers, our experienced team achieves results that make our clients proud.